Fandom: Meet the world’s largest flag. Or a few of them, actually! In England you can only wave flags when the game isn’t played. In Poland fans are getting banned from presenting anything they might cover themselves with. But regardless of various imposed regulations there’s always the competition between fans of different clubs that makes the beautiful game even more beautiful. One of the areas where supporters run a constant armaments race are the giant flags. Bandeira / trapo / bandera / sektorówka – no matter how it’s called in your language, here is the very biggest of football flags. Before we start, please note these are not all the world has seen, they’re just those most well known and those we managed to have (relatively) accurate dimensions of. Fans of Colombian Santa Fe presented their ‘Lienzo de fe’ (Cloth of faith) in 2007. Measuring 350x36 meters (12,600 sqm) it covered half the stands at Estadio El Campin. The sheer scale of the initiative caused fans to rely on sponsors for financial help, giving them a piece of advertising space in return. To make the dream of such a flag come true, local ‘hinchas’ had to campaign a few months, selling their own merchandise and collecting money. Final budget of the giant, weighing 1.8 ton and requiring some 350 people to get inside the stadium, stands at some $35,500. Unfortunately for Uruguayan supporters some question their flag’s record for the difference in length, which brings us to the ever-ongoing dispute: what counts most, what counts at all? Is it the length or the surface? Should flags created by external companies count? Can sponsors be involved? We’re not even trying to answer what seems to be a very individual issue, but we’re happy to be watching this amazing race for supremacy! By the time Peñarol joined the pack, neighbouring Argentina already had their rivalry well under way, to name just the amazing bandera of Racing Avellaneda (250x30 meters). But not every club uses a stadium big enough to challenge the ‘big boys’. Racing’s flag was already too big for their stands . We’re now getting to the events of last Wednesday. But not just yet, as the history of this flag goes back to 2011. 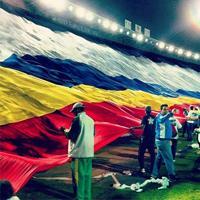 Yes, fans of Colombian Millonarios (derby rivals of Santa Fe, first flag creators) focused on getting their bandera done ‘by the book’ – by fans and for fans only, with no external funding. To cut costs they got some of the mothers sewing. They first displayed their flag, when it was 200x40 meters. They later added another 100 to it and ahead of this week’s presentation media were informing of hopes to beat the 600-meter mark. If the data presented by their club is correct, the flag managed to go much further than expected, reaching 750x40 meters (30,000 sqm), covering the stadium in 90%! Of course the sole process of carrying it inside required over 500 people. The expense was huge, standing at 120 million pesos (some €50,000 / $65,000), if we consider that fans kept their goal of doing it only by themselves. Just one day after the astonishing record in Colombia one more attempt was done. It was in Uruguay again, where Nacional decided to beat derby rivals Penarol, showing to the world their 600x50m (30,000 sqm) bandera. Though they managed to take the lead domestically, their flag seems to have the exact same surface as Wednesday’s one from Bogota. And while we’re at flags not presented on the stands, there’s also a great competition going on outside stadiums. In 2003 supporters of Besiktas carried a black-white striped flag through the streets of Istanbul. They were celebrating both their club’s centenary and championship, but what is remembered to this day is the flag itself, 2,000 meters long (8m wide, 16,000 sqm). But that record, just like the flag itself, is now torn into shreds. It was broken by Argentinean Rosario Central supporters, who beat the Turks by creating a flag only half as wide, but over twice as long. With similar surface (18,270 sqm), their banner was 4,350m long and 4.2m wide.